Even the best violinists go through a period of wanting to throw in the towel and abandon music. Learning violin can be difficult and time consuming, which presents a challenge to most children. As parents, we are tasked with helping our children overcome these obstacles without “forcing” them or allowing them just give up unnecessarily and throw away the years they’ve dedicated (and money you’ve paid) to their violin lessons. When your child wants to quit violin, you can help them get back on the right path. The approach you take should be based on their reasons for wanting to quit. Here are some suggestions for keeping your child in love with their violin lessons. Learning violin, like many other arts and interests, presents a challenge for kids. Sometimes, that challenge is overwhelming for the child and they are tired. They yell that they “hate” the violin and want to quit. Relax. The majority of the time, they will cool off and with encouragement and sympathetic ears, they will return to the violin quickly, learn the piece they struggled with and will show off their new skill with more pride than if it had been easily gotten. Frustration leads to confidence when it is dealt with in the right way. If you allow your child to quit at that point of frustration, they will continue to expect that pattern, setting them up for a lifetime of not gaining skill. The violin is a poor companion when your child feels lonely or doesn’t have time to hit the Eaton Centre with her friends because she is trying to learn a complicated piece of music. When youngsters feel left out of social activities, it is only natural for them to want to quit music and have more fun. They key is to incorporate more balance into your child’s life. If they miss a sleepover because of a recital, host a sleepover a few weeks after the concert. If they don’t have enough time to play with friends, work with them to modify their schedule. Alternatively, put them in group music classes and summer camps to help them make friends who share similar interests. 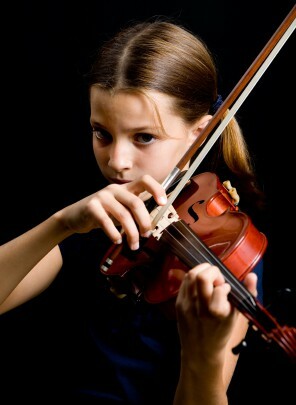 By compromising, you will help encourage your child to stick with the violin while still getting what they crave. Early violin lessons prepare the child to play music, but do not involve learning much music. The focus on holding a bow and a violin can seem boring to a child. The only thing to do here is to keep encouraging the child to work through it. Remind them that they will be playing beautiful music before they know it and that sometimes we have to do boring things to get to the good stuff. If the boredom is sustained, consider the violin teacher and style of music. A skilled teacher knows how to work with children to keep their short attention spans engaged. If you are not confident in your teacher’s ability to maintain your child’s interest, a new violin teacher might be the ticket to keeping your child interested in violin. Perhaps the child is not as interested in classical music as they are with Irish folkloric fiddle. Adjust accordingly. As they mature in their music development and skill, they will acquire any classical training they feel they need. Classical is not the only type of music, so let your child explore. Exploration is the antithesis to boredom and still involves the violin. If you really want to shake things up, enroll them in a summer music program (like Toronto Music Camp). This gives them a whole new side of music and allows them to see that violin isn’t so boring after all. In addition, being around peers who are talented musicians provides some motivation for your child to show off a little bit, which helps to rekindle their passion for violin. Interests, tastes, and desires change over time for all of us. Sometimes, these changes are dramatic in kids and can have a young musician wanting to ditch violin in favor of hip-hop dancing or as simple as trading in for a saxophone. In the long run, a change of musical instrument can do a world of good. Your child has likely gained a great foundation from their violin teacher that will translate well to their new instrument, which they will enthusiastically learn for years to come. If they want to give up music altogether, explore the possibility of keeping music in their lives. For example, if your child is interested in drama, perhaps they can switch to singing lessons and work towards a musical theatre program. Sometimes your child just isn’t interested and it is difficult to entice them to practice and perform. With a structured environment at home, the right instrument, and an engaging violin teacher, you and your child can overcome this hurdle with relative ease.